The Idaho National Laboratory is studying integrating run-of-the-river hydropower into a microgrid to make the city of Idaho Falls’ municipal power distribution more reliable. The $1 million, 2-year collaboration with the city of Idaho Falls was prompted by a December 2013 outage that left the city blacked out for hours in subzero temperatures. The lab’s facility includes a real-time digital simulator that allows researchers to simulate different real-world situations and better understand how microgrids interact with the grid, said Rob Hovsapian, lead engineer for INL’s Energy Systems & Technologies Division. “This allows us to understand the behavior of different types of hardware, their interactions, and how they need to be set up,” he said. 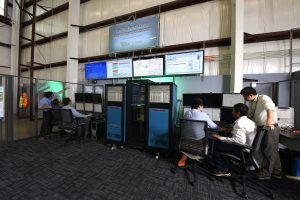 The simulator allows the lab to study how to connect and disconnect from the grid, he said. 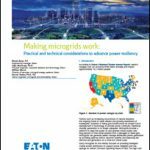 In addition to the Idaho Falls project, researchers are working on projects that include the Blue Lake Rancheria microgrid near Blue Lake, Calif. In the Idaho Falls project, the goal is to use a microgrid to store and dispatch hydropower and other resources in a “controlled brownout” to increase reliability and avoid blackouts, said Hovsapian. The aim is to disconnect the city of Idaho Falls from the grid if it becomes unstable and use Idaho Falls’ existing generation–including the run-of-the-river hydropower–to provide power to critical loads–hospitals, for example. “Most Northwest utilities have some kind of hydropower, which can add stability to the grid. Most people take it for granted. We want to show the value of it and how it can be utilized in the event of a blackout,” he said. “The challenge of run-of-the river hydropower is that there’s no dam,” said Kurt Meyers, project manager and market lead. With no dam, there’s limited ability to store water and control the output of the hydropower. The researchers are working to identify how much power they would need in the event of an emergency and regulate the river as much as possible to add stability. “Most likely we’ll need battery storage and some form of load control that turns the battery on and off,” he explained. The researchers are focusing on dispatching the run-of-the-river hydropower first and stored energy second. A controlled brownout is the third option when the grid becomes unstable. “Controlled brownout” is a misleading term for what the researchers plan to do, said Meyers. It’s really segmenting the system to turn sections of the distribution network on and off during an emergency. “We’re looking at how the internal grid is structured and where you could put switches to turn it on and off–which line segments will have critical loads and which line segments could do a controlled brownout if you’re running in island mode,” said Meyers. The city would decide which critical areas would get power. Additional resources — most likely renewable energy — may be added to the hydropower, he said, noting that it’s easier to permit renewable energy projects than fossil-fuel projects right now. Idaho Falls and INL will work with Schweitzer Engineering Labs, Washington State University and Utah Associated Municipal Power Systems to test systems on the project.